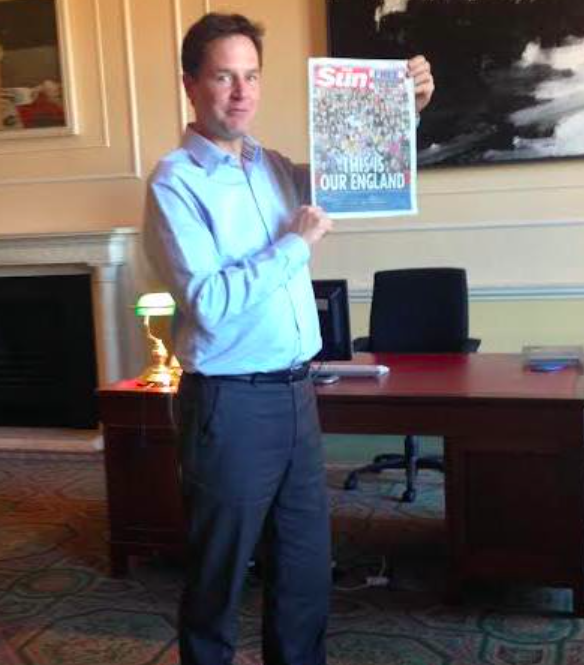 From a lot of the press coverage, you’d think it was only Labour leader Ed Miliband who made the huge mistake of endorsing the Sun by posing with it. And of course so did Boris and Farage. Do our leaders have no shame? Over a third of Hillsborough victims were kids or teens. And still being blamed. Taste, Tom. TASTE. Our leaders have no taste. But then, judging by who we’ve elected ever since I’ve been able to understand the process, neither has the electorate. every party leader has possed with a copy for the last 20 years. i thought ed had the brains not to obviously i was wrong. would be interesting to know what everyone did with their copy dont ya think? as its unsolicited mail we have every right to do what i did….shredded it,unread, put the shredded paper into an envelope, sent it back to the sun freepost. what did you do with yours? 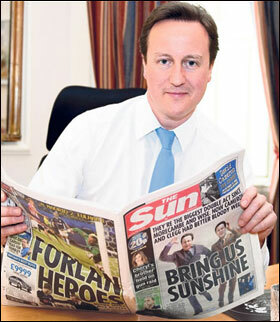 I’m not surprised that Cameron posed with Sun for one minute: it is, after all, the archetypal Tory rag that loudly and shrilly hailed everything Thatcher did as a work of breath-taking political genius, worthy of Churchill, Disraeli, and William Pitt, snr and Younger, if not indeed everyone going back to Oliver Cromwell, William the Conqueror and Boadicea. Everyone else was subjected to a strident campaign of vitriol and vilification. Cameron, however, will no doubt be desperate to stay in with Murdoch, ever since the Dirty Digger dumped Major in favour of Blair. Major considered this an horrendous act of disloyalty, and muttered about curbing Murdoch’s power. Major was exactly right there, but it was far too late to do anything about it. Murdoch has thus gone on to wax fat by manipulating ever government since Maggie by promising them support, all the while destroying the very institutions that have made this country truly great – the NHS, the welfare state, responsible government answerable to parliament and the people, and, indeed, just general standards of decency and civilised behaviour. As for Clegg, well, this just shows how the Lib Dems have been transformed into the Tories Lite. His master, Cameron, posed and so does he. Metaphorically and actually!…… Just like every UK party leader in a generation or more. I didn’t get one, so I didn’t get the chance to make my protest in any way. I have never bought or read a copy of the Sun since, as a student, I was appalled by their attitude to those who had died, or were about to die, in the Falklands War.